Dutch Police Hunt For "Bitcoin Bomber"
As yet another example of how bitcoin is increasingly attractive for use in the payment of ransoms, Dutch police (archive) are seeking the assistance of the public to capture a perpetrator who is distributing small explosive devices at Jumbo supermarkets throughout the Netherlands. The attacks, which reportedly began in May and continued in June and July have so far only caused property damaged. Dutch police claimed the perpetrator created a letter in Notepad which was then mailed to the Jumbo supermarket chain demanding that unless an unknown quantity of bitcoin was paid to him, the attacks would continue. The perpetrator is alleged to have followed up his first letter of demand with a musical greeting card containing a small amount of "explosive dust". 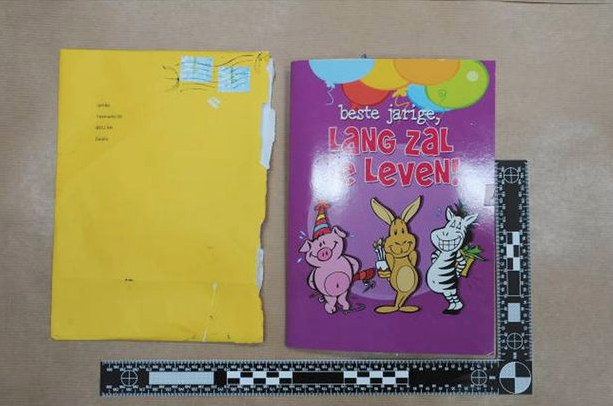 Dutch police have shared an image of that greeting card but not specific details of the ransom letter itself. This entry was posted in Netherlands, Ransomware, The Law. Bookmark the permalink.